My mind was set. I was going to sell my Triumph Street Triple and use the proceeds together with some cash I'd squirrelled away to buy a brand new Triumph Street Twin. You see, I'd wanted a Triumph Scrambler for years but when I saw the newly launched Street Twin with Scrambler pack I was smitten. I found myself with a free day in November so took myself down to the motorcycle show at the Birmingham NEC. I oohed at the Yamahas and aahed at the Hondas and then I arrived at the Triumph stand. The Street Twin with Scrambler pack with its high-level exhaust sat on a revolving plinth. I watched it for a few minutes and my mind was made up. 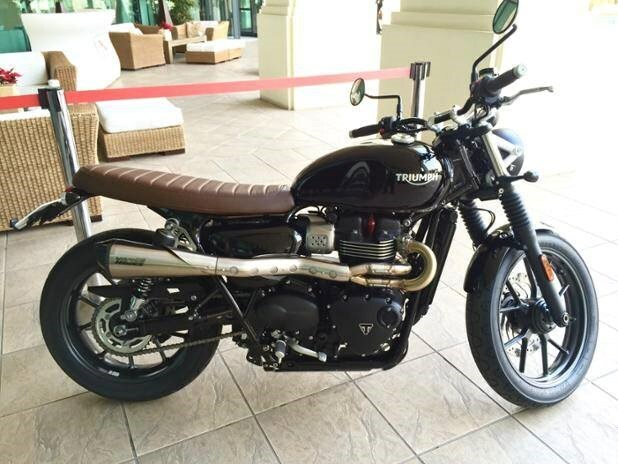 As soon as possible I'd head down to my Triumph dealer and put down a deposit on one. Then I sauntered over to the adventure bike section. The new Triumph 800 Tiger looked good. I swung a leg over it and immediately knew I'd fallen for the wrong bike. The Tiger was perfect. It looked great, and as I was sitting on it it felt great. The seat was the perfect height, the footpegs were in the perfect position, the handlebars were the perfect distance apart and the perfect distance from the seat. If ever a bike had been built to suit me it was the one I was sitting on, a Tiger 800XCx in blue. I talked to the Triumph lady. The top Tiger XCxwas at least £2k more than the Street Twin. Hmmm. On my way home and for the next few days I turned the problem over in my mind. I'd always wanted a Scrambler but the Tiger was so much more practical. The Street Twin was affordable but the Tiger was quite expensive. The Street Twin was a simple bike but the Tiger came with all sorts of useful features. The Street Twin would only ever be a summer bike but the Tiger would be a year round proposition, with it's screen, heated grips and hand guards. The Tiger looked great but the Street Twin looked amazing. I courted opinion and everyone told me the Tiger was the one to go for. I headed to my Triumph dealer to have a chat and look at the Tiger again. The Street Twin was so new it wasn't in the dealers yet. I walked into the dealer with my mind still not yet made up. There was a Tiger in the showroom in the same spec as that at the show - an 800XCx in blue with heated grips, a sump guard, engine bars, traction control, ABS, cruise control and a centre stand. It was a 2016 model but was sitting in the showroom in December and Christmas was fast approaching. The dealer was obviously getting a bit nervous about it sitting around so had knocked 10%, a full £1,000, off the price. That was it. Decision made. I bought the bike there and then and arranged for delivery in January. The next problem was shifting the Street Triple that was taking up the space in the garage that I needed for the Tiger. Being Christmas the phone didn't ring at all but when January arrived interest picked up. A few people called but the first to see it was a young chap called Adam. He arranged to travel up from the south coast to my place in Berkshire on a Saturday morning. When he arrived he had two mates with him, one dressed in bike leathers. The viewing was conducted in fine drizzle. They talked amongst themselves, they drank tea, they stroked chins and then Adam made an offer. I counter offered. He accepted. He gave me the cash then and there and his mate in the leathers rode the Street Triple home. I immediately headed to the dealer and we finalised the paperwork and arranged a delivery day, the next Friday. And so it was on fine Friday morning my brand new Triumph Tiger 800 XCx was wheeled from out of a van and into my drive. I was working at the time so had to wait for the next day for a good run on it. It was taller and heavier than anything I'd ridden before so I was a little nervous at first. But it was also better. Much better. I knew there and then I'd made the right choice. If I had bought the Street Twin I would surely have enjoyed it but at some point I would have known that ultimately it wasn't a bike for keeps, whereas the Tiger is.